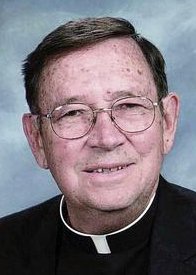 Father Daniel P. Devine, 80, pastor emeritus of Assumption B.V.M. Parish in Feasterville, died on July 11. Born in Philadelphia the son of the late Patrick Joseph Devine and the late Rose Ellen Devine, he attended Transfiguration School and St. Thomas More High School before entering St. Charles Borromeo Seminary. He was ordained May 22, 1965 by Archbishop John J. Krol at the Cathedral of SS. Peter and Paul. His first assignment was as parochial vicar at St. Katharine of Siena Parish, Wayne. He subsequently served as parochial vicar at Resurrection of Our Lord, Chester; St. Aloysius, Pottstown; Our Lady of the Rosary, Philadelphia; as a faculty member at Bishop McDevitt High School, and pastor of St. Agatha-St. James, Philadelphia. He was appointed pastor of Assumption B.V.M. Parish in 1993 and pastor emeritus in 2007. He also served as a senior priest at St. Charles Borromeo Parish, Drexel Hill. Msgr. Donald Leighton, who knew Father Devine for 60 years tracing back to their seminary days, vacationed with him for many years, both at a house in the Poconos shared by six priests and also on trips abroad. “He was funny, quick-witted and affable,” Msgr. Leighton said. “He enjoyed our friendship and the good things in life.” On a more serious note Father Devine “loved theology and Scripture,” Msgr. Leighton added, recalling the many discussion they had on those issues over the years. A parish Mass for Father Devine was celebrated at Assumption B.VM. on Sunday evening, July 16. His funeral Mass was celebrated on Monday, July 17 by Bishop Timothy Senior at Our Lady of Fatima Church, Secane. Among the concelebrants were Msgr. Michael Picard, Fathers John McBride and Father Roland Slobogin and Msgr. Leighton, who was the homilist. Actually, Our Lady of Fatima was the Church where he celebrated his first Mass, in 1965, and where one of the stained glass windows was donated by his family, explained Father Slobogin who is the pastor. Father Devine was planning to return to the parish as a resident priest before his final illness set in. Father Slobogin was a very young seminarian when Father Devine was ordained, and the custom at St. Charles was for all of the seminarians to line the sidewalk as the ordinandi walked by. “A special cheer went up as he approached, and people were saying, “Here comes Dan,’” Father Slobogin recalls. Father Devine is survived by his brother, Robert Devine and nieces and nephews. Interment was at Holy Cross Cemetery, Darby.